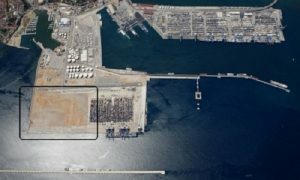 The Port Authority of Algeciras (La Autoridad Portuaria de la Bahia de Algeciras, APBA) has decided not to prolong any more the tender to build a new container terminal in the port, after the last extended term expired on 31 January 2018 and no bids have been received again, informs the APBA press service. The international public tender to select a suitable bid for a concession to construct and operate a container terminal at Phase B of Isla Verde Exterior was initially announced on 1 August 2016. According to the Port Authority, certain circumstances that took place in the port industry following that date affected the tender in a direct manner. These include the bankruptcy of Hanjin Shipping, who owned Total Terminal International Algeciras (TTI Algeciras) at the plot adjacent to the area dedicated to the new terminal, and the following sale of this facility. At the same time, the uncertainties generated in the port market by the stevedoring reform in Spain made the APBA prolong the initial term of the tender several times, as we already wrote earlier. With regards to TTI Algeciras, the Port Authority informs that the semi-automated terminal of 1.86 mln TEU capacity has been lately sold to the South Korean shipping company Hyundai Merchant Marine (HMM). The uncertain situation in the stevedoring sector, however, continues. The national dock labour reform is still pending, the negotiations between the companies and the dockworkers unions are still going on at a local level, without any final agreement reached so far. As a result, the Royal Decree of 12 May 2017, which was adopted by the Spanish Parliament last May, has not come into force as a regulation. “With all this in mind, the interested companies do not have any reference mark to evaluate and guarantee the return on investments which are required for this new project in Algeciras”, the APBA thus explains the lack of bids and its decision not to extend the tender any longer.